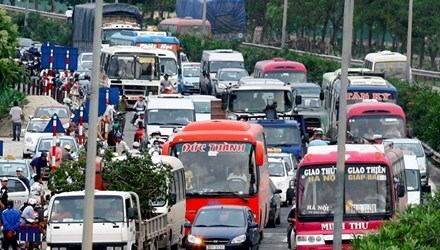 Hanoi (VNA) – Following falling petrol prices since early 2015 and requests for lower transport fares, many transport enterprises started reducing fares with an average rate of 7 percent. It would not be reasonable for transport enterprises to not reduce fares amid falling petrol prices, said Ta Hoang Long, a resident of Kim Ma Thuong ward, Hanoi. Chairman of Huong Lua Taxi Company, Dinh Van Sau said customers' expectations for reduced fares was reasonable and the company planned to lower fares by 500 VND per kilometre. Nguyen Minh taxi company also started lowering fares from 11,200 VND (0.5 USD) to 10,800 VND (0.48 USD) per kilometre since last week, according to director of the company, Nguyen Hong Minh. The company itself decided to reduce fees to protect customers' benefits amid reductions in petrol prices, said Minh. On the other hand, the move to lower fares was in compliance with Ministry of Transport and Ministry of Finance's directives, said Minh. "However, it is necessary that transport enterprises be allowed to determine fares by themselves. This is how market mechanisms work", Minh added. Chairman of Hanoi Transport Association, Bui Danh Lien also suggested transport prices be managed under market mechanisms so that transport enterprises could enhance their competitiveness by lowering fares and improving service quality. In Hanoi, more than 40 transport enterprises planned to lower fares with rates ranging from 2 percent to 11 percent, according to Lien. There was a gap in reduction rate among transport enterprises because some enteprises had not raised fares despite previous increases in petrol prices, said Lien. For example, Linh Anh taxi company in Son Tay district has maintained the rate of 9,500 VND (43 cents) per kilometer since 1999. While petrol prices account for only 20 to 30 percent of transport fare decreases, other costs including drivers' income and road tolls started increasing from January 1 of 2016, according to Lien. In addition, it often takes about 15 days for an enterprise to complete price adjustment procedures while petrol prices fluctuate quickly.